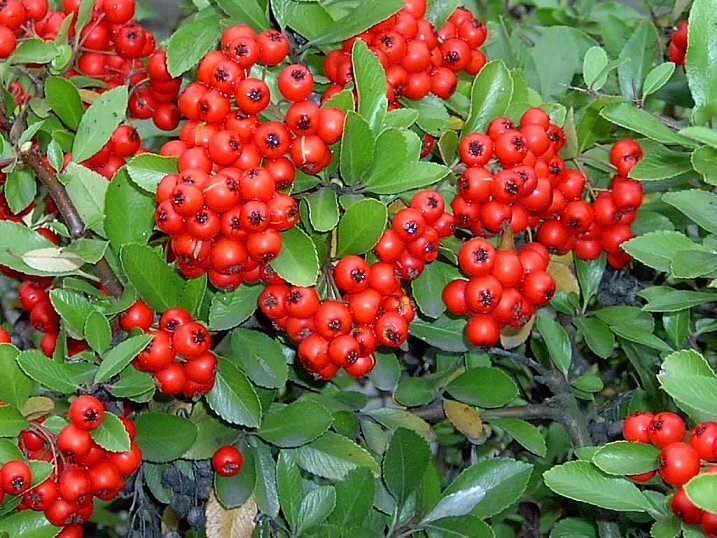 Pyracantha coccinea is a spiny shrub to 2 m tall, sometimes to 6 m tall, spines 1-1.5 cm long, young stems finely gray-hairy. Leaves alternate, stalk to 0.5 cm long, blade 2-4 cm long, narrow, lance-shaped, tip pointed, base tapered, margin finely toothed. Flowers dull white to 0.8 cm wide, radially symmetrical, in dense dome-shaped clusters 3-4 cm wide. Fruit fleshy, red-orange, crowned by persistent calyx, 5 seeds (Rehder 1986). Habitat: Horticultural plant usually in hedges or trained upright. Persistent in overgrown natural areas. Not known to escape.